Pickleball is growing quickly in popularity, and it is easy to see why – it is a really fun game to play. And unlike other competitive sports, pickleball is great for everyone, no matter what their skill level. One benefit is that a pickleball game doubles as a social activity due to the fact that the players are a lot closer together than they are in similar sports (like tennis). It encourages healthy indoor and outdoor activity, and it is a fairly inexpensive game to get into. But in order to play a decent game of pickleball, you need a good pickleball net. 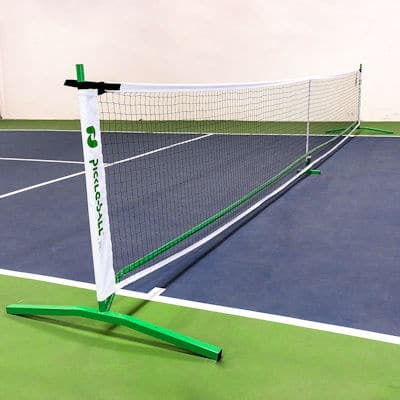 The biggest disadvantage to this is that you may have to travel some distance to a pickleball court in order to play a game, but this obstacle can be easily remedied by purchasing your own net. The quality of your pickleball net can really impact how you play the sport overall. It is important to note that not all pickleball nets are created equal; some nets are constructed much more sturdily than others. Price does not necessarily guarantee the quality of a net, but everybody has their own individual pickleball playing needs that they’d like to get out of their nets. Whether or not you’re simply looking to practice your hits or play a competitive game, the quality of your net matters. Haven’t you ever wanted to own a pickleball court yourself? If you own a portable pickleball net, you own your very own pickleball court. You don’t even necessarily have to mark out the court dimensions every time, especially when you’re just setting your net up for practice drills in the driveway. You will improve your skill – Obviously, the more you play, the better you will be at the sport. If you own your own net, pickleball paddle, and balls you will be able to play whenever (and wherever) you want. You can share with friends and family – Again, pickleball is a social sport, which makes it perfect for your whole family to enjoy. The next time you have company, you can invite them to a friendly game of pickleball! 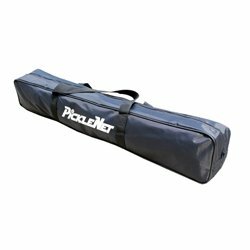 The 3.0 Portable Pickleball Net System sports the Amazon’s Choice award for the category of “pickleball net,” so that gives it a good reputation right off the bat. As far as stability goes, this net may take the cake. The design features a wide center foot stabilizer to battle against windy weather conditions. 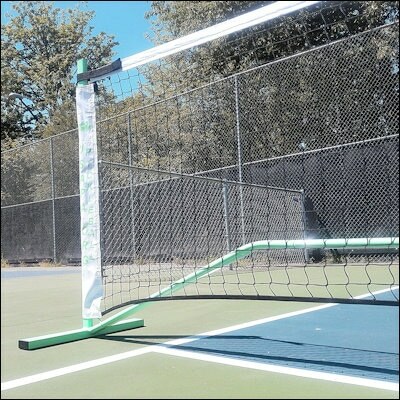 This also allows for a raised later crossbar that, when lifted off of the ground, keeps the net protected from further damage as well as giving the players the freedom to roll pickleballs back and forth under the net. Let’s take a look at the other reasons why this net set is so highly rated. Portable Design – This particular net system comes with a carrying case, and the whole package (complete frame, net, and carrying case) adds up to an easy 22 lbs, making it incredibly lightweight. Simple Set Up – This net is designed to have a quick set up where the metal frame easily snaps together and can be completed in a number of minutes. Strong, Reinforced Frame – The frame of this net is all metal and reinforced with a powder coating to protect it from rusting and increase its longevity. 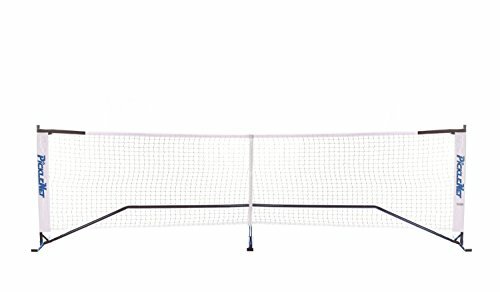 Very Stable – This net features wide legs with a unique bent design allowing it to maintain its stability even in the windiest of weather conditions. Another one of the Amazon’s Choice award winners, this net is another highly rated option. The designers made several improvements over previous versions of this net, to make it a little heavier and sturdier. They also incorporated oval shaped poles for increased durability. The poles themselves are powder coated to ensure the paint lasts. And the carrying bag is durable and well made, too. Everything about this portable net says quality. Portable Design – This portable net fits snugly into its convenient carrying case, making it easy to pack up and move wherever you want. This net is a bit heavier than the previous option, weighing in at 32 lbs. Reinforced Frame – The frame is made with already strong steel, and then reinforced with a dark green powder. Up To Official Pickleball Height Standards – The benefit of this net is that it is regulation height and size, being 22 ft wide and 34 in high from the center of the net. Efficient assembly – One of the most looked-for benefits of a portable net is that it is easy and quick to assemble, which this net definitely is. The USAPA Portable Pickleball Net System features the original metal frame system and is the USAPA official net. That means you can be sure that your home game will feel very similar to playing on a regulation court. The mint green framing is stylish and is supported by a new design of oval tubing that increases the overall strength of the design. Weighing in at only 32 lbs, relocating this net is a breeze. And the center support rod and adjustable tension straps ensure your net won’t sag in the middle. Portable – At only 32 lbs, you can toss this net into its convenient carrying case and tote it wherever you would like to take it to set up for your next game of pickleball. Although again, this net system is not quite as lightweight as the 22 lb 3.0 Portable Pickleball Net System. Play to Regulation Standards – While smaller nets can be convenient and suit smaller areas for a quick game, a serious pickleball player shouldn’t get used to those net dimensions. A net system that is up to the official regulation size standards is good for practicing for competitions and will help keep you sharp as a player. Simple Set Up and Take Down – Despite the easy snap-together system design, anyone can still struggle with putting things together. Fortunately, every piece of this system is numbered to make the pickleball net setup process as easy and headache-free as possible. Strong Steel Frame – This net is supported by a strong steel frame that is also coated with powder to be extra resilient. No More Net Sagging – There is nothing worse than when your net sags on the ground the whole time. This net system eliminates the potential for sagging by incorporating elastic into the bottom to protect it from that. Easy Storage and Transportation – The entire system can fit nicely in its nylon carrying bag (which is only 38 in long) and the separate pieces fit into their designated dividers to help with stress-free storage. This net system is another classic (hence the name) frame system that is made of steel. 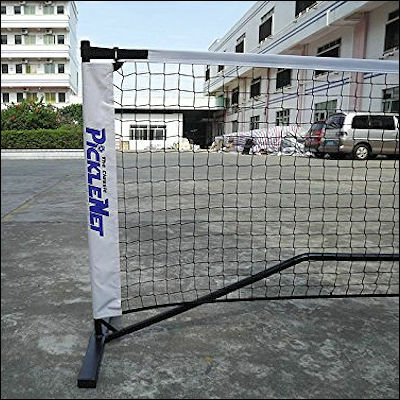 Even though it is one of the original net designs for pickleball, it has been upgraded over time to sport all kinds of new features. 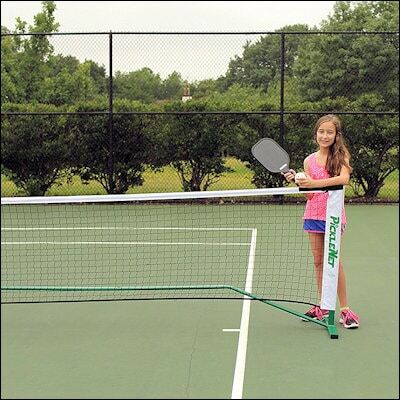 Like other entries in our pickleball net roundup, the Classic PickleNet is regulation size. But this net is lighter than many others, which makes it easier to transport, but may make it a little less sturdy during game play. The black posts are attractive, but not as durable as some of the other powder coated choices. And while the net is designed for both indoor and outdoor use, you should still always store your net inside to optimize its rust resistance. It has a stylish appearance – an all-black frame with white binding and blue text. Lightweight Design – Even though it is on the lighter side, the design doesn’t compromise its sturdiness at all. Strong Center Support – The additional center support comes from a rod placed in the middle of the net that prevents the net from sagging unexpectedly. High Quality Construction – The netting is made of a durable black nylon material and utilizes a vinyl headband to protect the net edges from harm. Easy Set Up and Take Down – A quality portable net system simply needs to be easy to set up and to take down, otherwise it isn’t exactly portable is it? Fortunately, this net design is also user-friendly throughout the setup process. REGULATION SIZE PICKLEBALL NET SYSTEM - 22 Feet Wide, 36 Inches at the end posts and 34 inches at center strap. ENHANCED CENTER SUPPORT - Wider, stronger and more rigid patented center support structure makes this set more stable and durable than the competitors. 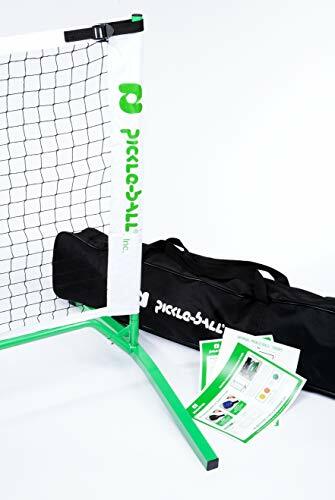 All of these awesome portable pickleball nets can be found on Amazon with prime shipping deals to make them even more appealing. 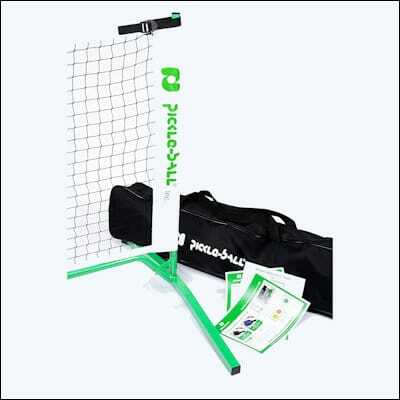 Portability – A lot of pickleball nets are designed to be portable so that you can set up a game wherever you want. A portable pickleball net gives you the opportunity to set up your very own court without investing in a costly permanent pickleball court that takes a lot of time and resources to put together. Versatility – One of the many great things about pickleball is its versatility – you can play a game in a parking lot, in an alley, in your driveway, or even right in your front or back yard. Convenience – A portable net system is created with convenience in mind, being made with lightweight and affordable materials that, if done correctly, can be set up in under ten minutes. For many people, so much of their valuable time is wasted driving to the nearest pickleball court, but with your own net you can set up a game right inside your garage. Affordability – Purchasing a portable net is the inexpensive alternative to investing in an entire pickleball court for yourself, or for the membership cost to a community center or club that has its own court. Net Durability – You obviously want your net to last as long as it possibly can so that you get your money’s worth out of your purchase, and some nets are definitely made to be more lasting than others. You should be looking for a net that is designed to withstand hours of outdoors play. Net Post Durability – The material that the net post in made of is also incredibly important to determining the durability of the overall design. For example, you should look into nets with aluminum posts or steel posts, as these are much more durable than those that are made of plastic. Plastic nets run the risk of breaking shortly after you begin using them or when you need your net most. Some types of metal net posts are made with a powder coating on the outside to created added protection for the post against possible rust. Cost Does Not Always Reflect Quality – Since you will be spending upwards of $50 on a decent quality pickleball net, it can be easy to get lost in the numbers. You may run into a terribly expensive net option that sports all kinds of features that look quite appealing, but it is important to consider what options are best for your play. A good tip in this case is to look at the reviews for that particular net to determine if the seller is reputable and if the net is durable and holds up over time. Recommendations from friends, family, and trusted online review sites are very helpful in these scenarios. What the Specifications of the Net Are – Some nets are designed for specific purposes. For example, one net may be created to withstand windy conditions while another may not.